Dil dhoondta hai phir wohi fursat ke raat din…. 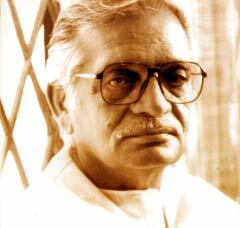 Sampooran Singh Kalra, better known as Gulzar, was born eons ago on the 18th of August. Today, on his birthday, I wonder if I could felt so much in depth the many emotions he has voiced for me. “Tere bina zindigi se shikwa to naheen….Tere bina zindigi bhi lekin zindigi to naheen”…..moments in which love was lost but life drudged along, aimlessly, lovelessly, he said what everyone who has known that heartache felt. “Tujh se naraaz naheen zindigi hairaan hoon mein”…..whenever life did not make sense, but acceptance was required nevertheless, these words carried me through…and somehow helped make some sense of the complexity of human relationships when he said “zindigi tere gham ne humain rishtay naye samjhaye”. And hearing this, I knew that life is never simplistic, but life goes on. “Mera kuch samaan tumharay paas para hai”. How can one go through heart-breaks and break ups and not have heard this? Gulzar Sahab’s imagery in this one makes abstract memories palpable. One can literally touch those memories when you hear these words….feel the velvet of yesterdays with one’s fingertips when he says: “Aik sau sola chaand kee raatein, aik tumharay kaandhay ka til, Geeli mehndi ki khushboo, jhoot moot ke shikway kuch, jhoot moot ke waadey bi sab yaad kara do…..sub bhijwa do, mera woh saman lota do”!!! His poetry is so relatable because the words are easily understandable and complex emotions are packed in tender every day words. He can slide from the classic, pristine romantic poetry in “Aap ki aankhon mein kuch mehke huey se raaz hain” to the deliciously raunchy “kajra re, kajra re, tere kaare kaare naina”, maintaining a class of his own in each situation. And then there is romance and spritely love and excitement and fervour in the poetry of “Saathiya, madham madham teri geeli hansee”. The imagery in this particular set of lyrics is just fabulous……he calls her laughter “Sondhi see hansi teri” and we all know that “Sondhi” is the adjective used for the smell of wet soil after a spray of rain. And he says, as the lover, that the beautiful beloved should not go out into the garden wearing “peeli dhoop” (yellow sunlight) otherwise “bhanwray tum ko sub chairain ge…phoolon mein mat jaana” (the bees will bother you so don’t go near the flowers). So smoothly he alludes towards her beauty and sweetness that it makes one want to meet this beloved. But to me and so many others, it is this piece of poetry that is the Pièce de résistance when it comes to contemporary Hindi poetry celebrating that painful, beautiful human emotion we call “nostalgia”. In “Dil dhoondta hai phir wohi fursat ke raat din”, the first two lines are of course from Ghalib and Gulzar builds it up from there, but in such a way that while he pays a humble tribute to the incomparable Ghalib, he manages to maintain his own distinct style and gives us lasting phrases that resonate inside each one of us: “jaaron ki narm dhoop aur aangan mein lait kar…..aankhon pe kheench kar tere daaman ke saaye ko”……only someone heartless would not melt on these words and someone who cannot relate to the words in this piece of poetry needs to love more and live more. So here’s to Gulzar. A humble thank you for his words and his genius. aundhe pade rahen kabhi karwat liye huye…..
taaron ko dekhte rahen chhat par pade huye…..
aankhon mein bheege bheege se lamhe liye huye…. Sometimes lying on the side and sometime on the stomach. Posted in Poetry, Straight From The Heart and tagged dil dhoondta hai, Ghalib, Gulzar, kajra re, Mera kuch saman, saathiya, tere bina zindigi se shikwa. Bookmark the permalink.